500 additional 1/8-inch diameter special screws with 3/16-inch coarse threads for the Squeeeeek No More squeaky floor repair kit. The coarse thread of the special screw prevents it from being wrapped in carpet nap and because the score on the neck of the screw allows it to snap off below the surface of the floor. 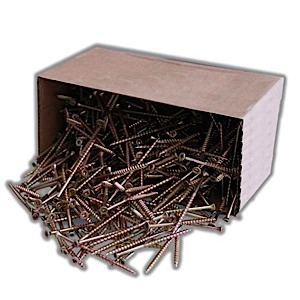 Two hundred and fifty additional 1/8-inch diameter special screws for the Squeeeeek No More squeaky floor repair kit. © 2019 MySqueakyFloors.com, all rights reserved worldwide.